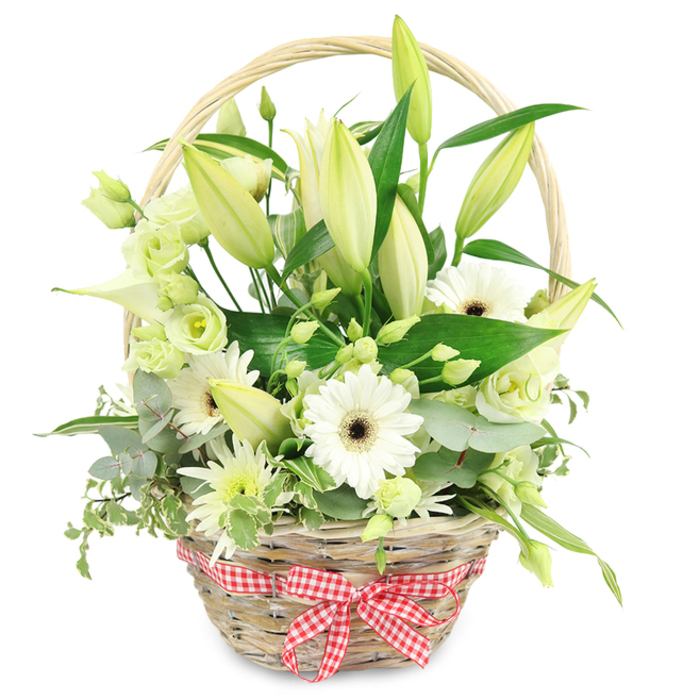 Sweet and elegant basket consisting of the freshest lilies, gerberas, chrysanthemums and lisianthus. Bring a burst of joy to someone's day and make them feel appreciated and admired. Original size contains approximately 15 stems. This was my first time ordering flowers online. I was lucky to have ordered with Handy Flowers. The basket was delivered with care. It still looks amazing even after a few days have passed. Thanks! I'm pleased with the flowers and the timely delivery. Classy and stylish arrangement. Ordered it as a gift for my colleague at work and she liked it very much. Thanks, I will call you again when in need of flowers! Beautiful basket with even more beautiful flowers! Delivered on time for my sister's graduation party. Thank you for the prompt delivery and the wonderful flowers. Ordered this basket for my grandma's 70th birthday and she completely fell in love with it. She said that was the most beautiful flower arrangement she'd seen in her whole life... The sweetest thing to hear! WOW this basket is amazing!